Be the Man is a practical (and funny) guide that will prepare grooms for everything leading up to, during and after the big day. What is The Man Registry? TheManRegistry.com is an online resource for a grooms and is the internet leader in wedding tips, advice and gifts for men. The website features a specialized wedding gift registry featuring hundreds of wedding gifts tailored toward grooms, including electronics, barbecue grills and accessories, bar supplies, tools and outdoors gear and items from favorite sports teams. In addition to the wedding registry, the website also offers a wealth of information, how-to articles and resources designed to help successfully guide the millions of grooms who get married each year through every step of the engagement, wedding and honeymoon planning processes. In recent years, we have also expanded to offer bridesmaid gifts and wedding day accessories. Two brothers and their brother-in-law founded TheManRegistry.com in 2008 when they noticed that many of their close friends and family were getting married, but too often were registered for wedding gifts that were strictly geared toward the kitchen and bedroom. Where were the wedding gifts that the groom could get excited about? It was clear that creating a wedding registry tailored to grooms was necessary. Thus, TheManRegistry.com was conceived and built as the place where grooms and brides could register for wedding gifts they could put to use in the backyard, garage, or basement bar. We celebrated the 10-year anniversary of our launch with a party at Martin City Brewing Company. We stopped by Kansas City Live to talk about some of 2018’s coolest groomsmen gifts. We showed off some of 2016’s most out-of-the-ordinary groomsmen gifts on Kansas City Live. The Man Registry relaunches with a new, mobile-friendly website designed to serve our customer’s growing needs. Co-founder Chris speaks on the Inside the Minds of Top Wedding Bloggers panel at Wedding MBA in Las Vegas. The panel features representatives from The Knot, Lover.ly, Bridal Bar and BeInspired PR. We contributed a piece to the The New York Times on which wedding traditions need to go away. We appeared on the ABC 20/20 special “Wedding Confidential” discussing the groom’s role in the wedding planning process. Fast Company features us in their story Here Comes the Dude: Wedding Planning Gets Manly. We become published authors! 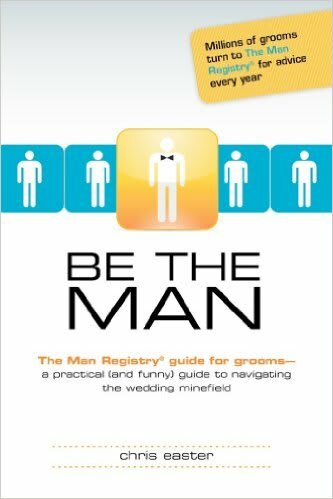 Be the Man: The Man Registry Guide for Grooms is released on January 10th. Co-founders Chris Easter and Bob Horner are named two of Inc. Magazines Top 30 Entrepreneurs Under 30. Featured in NY Daily News on choosing the best man. Co-founder Jimmy Horner is interviewed on Kansas City’s KMBC TV. We partnered with Save the Ta-Tas to donate a portion from every sale on our site to their foundation. Entrepreneur.com showcases us as experts in marketing to men. The Man Registry teams with The Tyra Banks Show to find America’s biggest “Groomzilla”. Our hometown Kansas City Star gives us our first major write-up. We totally saved the newspaper clipping and put it in our scrapbook. Our media tour promoting launch includes stops at Mashable, Entrepreneur, Thrillist and The Big Idea with Donny Deutsch.